Our main goal at SIIMPLER Roofing is to provide the best roof system money can buy, with the least amount of money out of pocket for our customers. It's that simple. Please give us a call and let us help you get started today! The recent storm damage Rockwall has suffered has definitely left a lot of people in need of hail damage repair. Many of you have tried booking with other roofing contractors in Rockwall and ben put on a long wait list. Fortunately, we have a long standing trust with our teams, and right now we can get to your home within one to two weeks. You can be certain that everything we do will meet your highest standards, and that everything will be done the right way. Our professionally trained personnel always get the job done under strict quality control during construction and using only the highest quality products. We have a defined final inspection that makes sure you don't encounter any unexpected problems after completion. That can give you complete ease of mind. We know that you need your storm damage repaired quickly and efficiently, with integrity and professionalism that you can depend on. We stand behind our word, and we will get the job done right. With this Texas weather, we never know when the next hail storm or tornado might strike, so we keep plenty of our hard working teams working so that they can work for you, should you ever need us. Hail damage to your roof is not always immediately noticeable unless you know what to look for. Sometimes water damage from undetected leaks can cause unnecessary problems, just because you had a problem and didn't know it. Call us today at 972-533-0640 and we will come out, crawl around on your roof, and give you free inspection. Absolutely free with no obligation on your part. Let us take the risk so you don't have to. If you would prefer to check your own property for signs of hail damage, then check out this short video from Paul Mason, owner of Mason roofing. He will teach you what to look for when accessing the damage to your property after a storm blows through. There could be damage to theory areas of your property as well, and Mason Roofing is here to help with all of you repair needs. 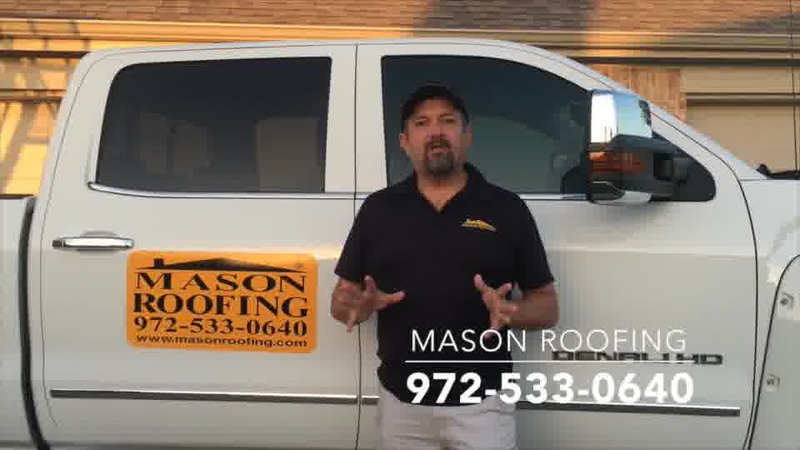 Roof - You will have to climb up and check your roof for dent marks from the hail strikes as well as signs of debris in your yard after it rains. Trees - Check you yard for downed limbs and leaf debris. Window Screens - Hail will make your screens look like a cat climbed up, leaving streak marks. Window Beading - Check your window beading for holes or cracks left behind the hail storm. Gutters & Downspouts - Look for visible denting on both the gutters and downspouts. Fence - Your fence will have rooted stains if it has been damaged by hail. Air Conditioner - You may have to comb your coils if they have been dented by the hail. Painted Areas - Check all of your painted areas like siding, gutters, etc. We undertand that finding contractors to repair your home is a difficult process. We can save you time, money, and endless energy by taking care of all of your contracting needs through our parent company, PML Mason Contractors, We can repair fencing, gutters, skylights, paint, window screens, and more. Your one call stop to all of your home repairs.